Caring for your child's oral health should start early in life. Infants' gums can be cleaned with a soft cloth after feedings. Dental health becomes even more important after the first teeth appear. Studies show that more and more children are developing cavities as toddlers, sometimes as early as two years old. 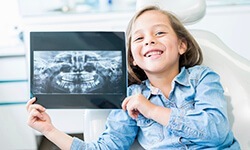 We strongly recommend, in accordance with the American Academy of Pediatric Dentistry, that children begin regular visits to the dentists around their first birthday. Although children will eventually lose their baby teeth, practicing good oral hygiene is a habit that should start early and continue through adulthood. Children are often unreliable when it comes to maintaining optimal oral hygiene. That's why we offer sealants and fluoride treatments, which are additional insurance against tooth decay. 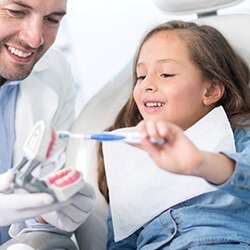 Not only does an examination help to ensure that your child's oral health is on the right track, we can also discuss ways in which you can help your child develop good oral care habits. At your child's first visit, we will ask you questions about your child's health history, including development and teething, as well as oral habits, such as thumb sucking or grinding. Then, one of our hygienists will examine your child's mouth. Depending on the results of the evaluation, and the cooperation of the child, we may also recommend that they have a cleaning. We recommend taking intraoral radiographs once the teeth touch and the child is old enough to accept them. For the first visit, you may want to fill out registration forms prior to your arrival in order to minimize your time in the lobby. Also, bring a snack, favorite toy, or familiar blanket with you to make your child more comfortable about the new atmosphere. Although fluoride is not just for children, a professional, concentrated fluoride treatment can help your little one ward off cavities. Fluoride is a naturally occurring mineral that humans consume from foods. Some animals, like sharks, naturally have a layer of fluoride on their teeth. Why is fluoride good for teeth? This amazing mineral has the ability to attract other minerals that re-mineralize and strengthen tooth enamel. When we consume starches, including sugars, microorganisms that live in our mouths use this to create an acid. This acid saps minerals from tooth enamel. Though enamel is the hardest substance your body produces, it is weakened by acid. In a weakened state, enamel is vulnerable to the bacteria that cause tooth decay. So, fortifying teeth with fluoride is one way to deter cavities. Dental sealants are thin, clear plastic coatings that protect the grooves of the teeth from acids and bacteria. With a small brush, we apply a creamy resin to the molars and primary chewing teeth. After the resin hardens, it protects teeth for years. 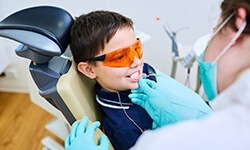 Dental sealants are especially important for younger children who have questionably effective brushing habits, especially in the hard-to-reach places in the mouth. Also, children who eat or drink sugary foods can benefit from dental sealants. In most cases, dental sealants can last many years on permanent teeth, needing replacing only after they wear out. Replacing them is a relatively easy procedure too. Tooth decay is one of the leading health problems for children and teens. Regular checkups can help treat and prevent tooth decay, a precursor to gum disease and other oral health problems. Maintaining a healthy diet is especially important for the oral health of children and teens. Encourage your kids to make healthy choices, like cutting down on sodas, candy, and other sugary food and drink. Oral hygiene is not just for your dental health. Having healthy teeth and gums promotes the overall confidence of your child, an important part of growing up. By encouraging dental health, you are setting your child on the path to success. Wisdom teeth, or third molars, often begin to emerge during the adolescent or teenage years. We can check for the development of these teeth to determine if your child has room to keep them. They may not look cool, but wearing a mouth guard during sports and athletic activity can help protect your smile from chips, cracks, or other injuries. Don't chew on the mouthguard as it will deteriorate faster and be less effective. Be sure to wash your mouthguards and mouth pieces, especially those used for playing band instruments. It's a good idea to keep a spare tooth brush in your back-pack or sports bag. Brushing after eating snacks or drinking sugary drinks can help prevent cavities. Even a simple water rinse can be helpful. Even when not at home, try to make healthy choices when picking lunch-time foods, snacks, and drinks. Not only do these choices help your overall health and development, but protecting your oral health can lessen the chance of dental procedures. If you must chew gum, choose xylitol gum. It is the only sugar substitute that stops tooth decay.